Somehow Apple always seems to pick the catchiest songs for its iPod commercials. 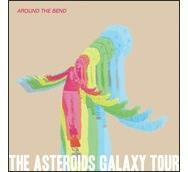 The latest iPod touch spot is no exception; the accompanying track, “Around the Bend” by The Asteroids Galaxy Tour has definitely lodged itself in my brain like Phineas Gage’s infamous iron rod (man, the things I remember from my high school psychology class). But how do certain songs end up being chosen from the multitude to represent Apple’s products? As you might rather suspect, two words: Steve. Jobs. In an interview with Songfacts, The Asteroids Galaxy Tour's Lars Iversen explained how their track came to represent the funnest iPod ever. Lars: We have this company working for us in the States called Synch, and they got in touch with Apple. I think they had this meeting with Steve Jobs himself, and he picked that song out of the bunch and said, “This is it, this is the new track for the iPod Touch.” Apparently he just loved that track, but we never saw it as one of our singles. We have some other songs that we thought would be great singles, and that would work cool on for the radio, but he really loved that song. We know Steve’s a music aficionado (I mean, come on, he dated Joan Baez), and he clearly has a good ear for figuring out what will resonate with consumers. I have to admit I’ve bought a number of Apple ad songs from the iTunes Store, if only to get them the hell out of my head. Curse you, Apple, and that sneaky “Buy This Song” link you’ve started putting at the end of the web videos—your evil plans are working on my feeble mind. There’s more in the above interview about the 30-second edit of the song (which the band was a little bummed they didn’t get to make themselves), Apple’s secrecy, and what the song is actually about (hint: it’s not the iPod touch’s innovative accelerometer-based gaming). Update (12/10/08): For some reason, the wording of the particular quote that we included above has been changed to omit any reference of Steve Jobs, with no explanation. Very odd.